"Sin" is walking our own way in rebellion against God's will. - When we walk away from God, we walk away from life. Sin brings death. "For the wages of sin is death" (Romans 6:23). Our own efforts cannot save us. As sinners we futilely try to find life's true meaning in the wrong ways and places. "For it is by grace you have been saved, through faith and this not from yourselves, it is the gift of God-not by works, so that no one can boast" (Ephesians 2:8-9). 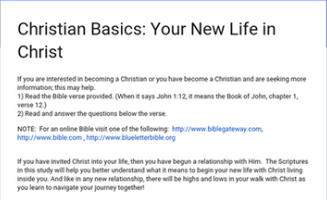 He is the way to new life. "Therefore, if anyone is in Christ, he is a new creation; the old has gone, the new has come!" (2 Corinthians 5:17). He gives inner peace. "We have peace with God through our Lord Jesus Christ" (Romans 5:1). He gives eternal life. "But the gift of God is eternal life in Christ Jesus our Lord" (Romans 6:23). To be sorry for your sins. To be willing to forsake your sins. To have your life changed by Christ. Christ is ready. "Here I am! I stand at the door and knock. If anyone hears my voice and opens the door, I will go in" (Revelation 3:20). Receive him now. "Yet to all who received him, to those who believed in his name, he gave the right to become children of God" (John 1:12). A caring church family is waiting to accept you and help nurture you as a Christian. We would love to talk to you about Jesus.